MG doesn’t work for a lobby firm but her office is down in lobby-ville on K Street in Northwest D.C. She has a pretty fair commute until she crosses Pennsylvania Avenue, and then the traffic gets thick for the two blocks north to her building. She usually rides her daily steed, a Novara Randonee, which she calls the pickup truck of touring bikes, or her Rivendell Quickbeam singlespeed. 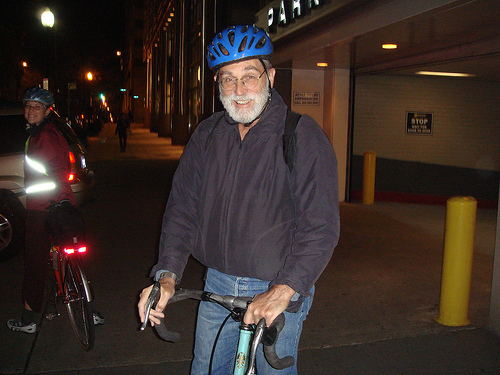 Here’s a photo of K Street at Night, and one of MG’s co-worker, Bruce M. who is entirely comfortable riding at night without a front light — MG and I are going to give him one of our extras. 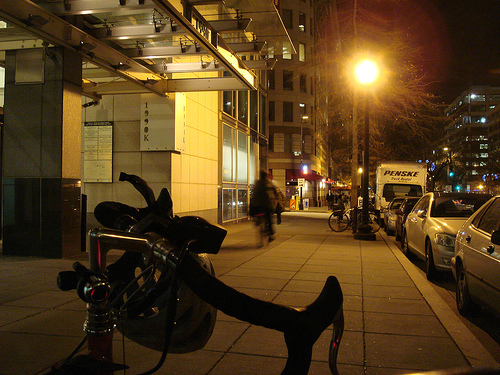 These short days mean that one end of your ride or the other is in the dark, I guess. I admire the commuting dedication.